I could never have learn ed how to make apricot cheesecake recipes when I was young and still living with my parents; we never had apricots. Apricots have always been a very important product in many parts of the world. Even though the English settlers brought this great fruit to the New World, in my little part of the world we did not have access to them. Even though most of the apricots produced in the United States come from California, it was after I married that the dried ones became readily available in most grocery stores in my area. I started using these to make many of my now favorite recipes like my number one favorite cookies and the apricot cheesecake recipe. Apricots are a close cousin to peaches which my family did enjoy when they were in season. Both of these fruits are “stone fruits” named that because they contain a stone like seed inside. 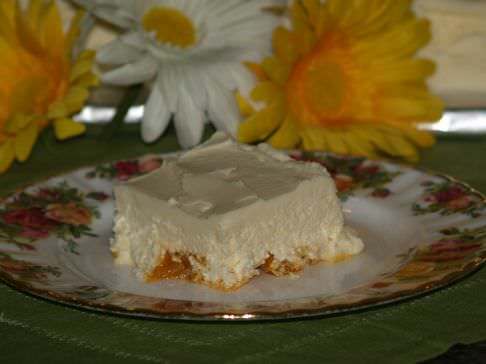 They make low calorie snacks or a sweet addition to the diet and wonderful desserts like the apricot cheesecake recipe. Apricots offer many health benefits to the diet when eaten fresh; not necessarily so in sugar heavy desserts like the apricot cheesecake recipe. Apricots are very rich in beta carotene which is linked to protection from heart disease and cancer. If all these are not good reasons to eat apricots, sampling the delicious flavor with is sure to entice you. They are so good in many recipes even entrees; but apricot desserts are exceptional. Like I said my favorite cookies in the world are apricot filled and there are wonderful recipes for bar cookies and coffee cakes. Of course learning how to make apricot cheesecake recipe is one of the best apricot recipes. 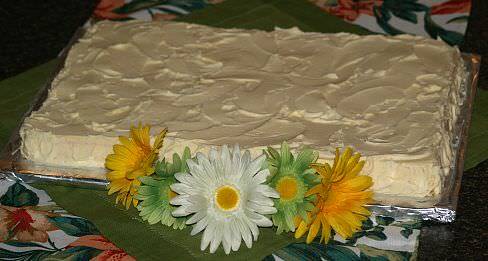 This is the best apricot cheesecake recipe with a white chocolate frosting recipe; great to bake for a large party cake idea. Learn how to make cheesecake for a crowd size gathering with this recipe. A friend made this for a wedding which I attended; it is great. NOTE: These cakes can be frosted in the pan or on a cake tray. 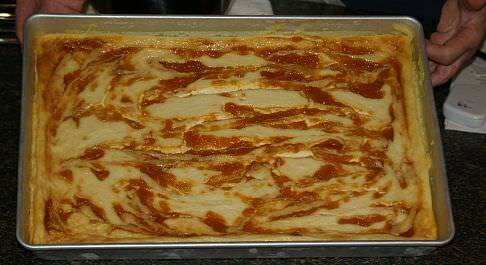 Grease and line with wax paper (if you are turning out on a cake tray) or (if you are frosting in the pan do not line with wax paper) two 18 X 12 X 2 inch cake pans; preheat oven to 350F degrees. Beat together cream cheese and sugar; beat in salt and cornstarch until smooth. Beat in the eggs one at a time beating well after each addition; scrape sides and bottom and beat until smooth and creamy. Add lemon juice and vanilla and beat to blend in; add sour cream and beat only until blended. Pour filling into pans; drizzle apricot puree over the batter and swirl it in with a knife or fork. To bake, set pans in larger pan and fill larger pan (no more than 2 inch sides) with 1 inch boiling water. Bake in preheated oven for 50 minutes; turn off oven and allow cakes to set in oven for 1 hour (DO NOT OPEN DOOR). Cool to room temperature; wrap and refrigerate. NOTE: I can bake only one cake at a time so I make one half recipe at a time but I make the full recipe of apricot puree. NOTE: I place the water pan on the rack below because my pan does not fit into a suitable pan. Combine apricots, lemon juice and water; cover and let set 2 hours. Add sugar and simmer until apricots are tender. 20 to 30 minutes (Watch so it doesn’t scorch). Run mixture through a strainer to make puree for the apricot cheesecake recipe; measure 3 ¼ cups to use. Break chocolate in pieces and melt in double boiler over hot water; stir until smooth and let cool. Beat cream cheese until smooth; beat in cooled chocolate. Add lemon juice and butter; beat until creamy and smooth. Frost cheesecake and pipe on trim; add decorations to fit the occasion. This apricot cheesecake recipe makes a beautiful presentation. Combine and mix gelatin, 1/3 cup sugar and salt in double boiler. Beat yolks and milk together; add to gelatin mixture and stir to blend. Cook for 5 minutes in double boiler stirring until gelatin dissolves. Remove from heat and add lemon rind; cool to room temperature. Rub cottage cheese through a sieve; stir in the yogurt and vanilla. Fold cheese mixture into the gelatin mixture; chill. Beat the dry milk with ice water on low speed of mixture until thickened and blended. Add lemon juice and continue beating until whipped. Fold whipped mixture into cheese mixture. Beat egg whites until frothy; gradually add remaining 1/3 cup sugar and beat to stiff peaks. Fold egg whites into cheese mixture and chill slightly. Turn into 9 inch spring form pan. Mix crumbs with mace and sprinkle on top of cheesecake. Chill until firm; prepare apricot topping and spread over cheesecake. Combine all ingredients in heavy saucepan; cook until mixture thickens then cool. Spread cooled topping over cheesecake; refrigerate until set. Melt butter in over low heat in large skillet; remove from heat. Add flour, chopped and ¼ cup sugar; blend. Press mixture in bottom of 9 inch spring form pan; refrigerate until firm. In small saucepan combine gelatin and reserved 1/3 cup apricot liquid; let stand 1 minute. Cook over low heat stirring constantly until gelatin dissolves; cool. Puree apricots in blender; add ½ cup sugar, cream cheese, yogurt and lemon peel. Process mixture until smooth; combine processed mixture with gelatin mixture. Mix until well blended and pour into prepared crust; refrigerate overnight. In small saucepan heat jam until softened; stir in amaretto. Carefully remove sides of spring form pan; drizzle jam over each serving. Cut chocolate crème roll in ½ inch slices; use to line 10 inch serving dish. Drain apricots reserving ¼ cup of the syrup; SET ASIDE 4 apricot halves for decorating. Place remaining apricots in food processor bowl; process until pureed. In large mixing bowl beat cream cheese, sugar and lemon juice until fluffy. Beat in egg yolks until blended; beat in pureed apricots until blended. In small saucepan combine gelatin and reserved apricot syrup; stir well. Let mixture stand 3 minutes then stir over low heat until gelatin dissolves; cool. Stir cooled gelatin into cream cheese mixture. Refrigerate 30 minutes until mixture is thickened. In medium bowl beat whipping cream until soft peaks form. Beat in powdered sugar until stiff peaks; fold HALF into cream cheese mixture. Spoon remaining whipped cream into a pastry bag fitted with rosette tip; refrigerate. In a medium bowl beat egg whites until stiff but not dry. Fold beaten egg whites into cream cheese mixture. Pour cream cheese mixture into cake lined dish and smooth the top. Refrigerate cheesecake for several hours (At least 4 hours) or until set. TO DECORATE combine chocolate and shortening in small saucepan. Stir over low heat until chocolate and shortening are melted and blended. Remove from heat and cool; spoon into a pastry bag with plain writing tip. Pipe chocolate in parallel lines about 1 inch apart on top of cheesecake. Draw with the point of a sharp knife across piped lines in alternate direction to make feathered effect. Pipe chilled whipped cream mixture in small rosettes around edge of cheesecake. PREP COCONUT by spreading coconut on baking tray. Toast in oven until golden brown about 10 minutes; set aside. TO MAKE SAUCE combine all sauce ingredients in stainless steel saucepan. Bring mixture to a boil; REDUCE heat to medium low. Simmer stirring occasionally until mixture is like a thick syrup (30 to 40 minutes). Cool to room temperature; cover and refrigerate until needed. Bring apricots and water to a boil in small saucepan. Remove from heat, cover and let stand until fruit is soft (About 30 minutes). Drain apricots and pat dry; place in food processor with steel blade. Add sugar and egg WHITES; process until apricots are minced scraping down sides. NOTE: Mixture should be of a thick and fluffy consistency. Add the ½ cup of toasted coconut to food processor; process until finely chopped. Scrape mixture into a medium bowl; stir in remaining toasted coconut. Cover bowl and freeze just until firm about 20 minutes. Spoon apricot mixture into a 9 inch spring form pan. Press mixture evenly over bottom of pan forming a crust. NOTE: You can cover fingers with plastic wrap to press mixture. Bake until light brown about 15 minutes; place on rack to cool. TO MAKE FILLING combine cheese, sugar and salt in a large mixing bowl. Beat on medium speed until smooth stopping occasionally to scrape sides. Increase to high speed and beat until creamy and smooth. Reduce speed to medium and blend in sour cream, rum, lemon juice and vanilla. Add eggs and beat just until combined; pour into the cooled crust. NOTE: Tap pan once or twice on solid surface to level. Cover bottom and sides of pan tightly with 2 layers of foil. Place cheesecake in slightly larger shallow baking pan. Pour hot water in the larger pan half way up the sides of the spring form pan. Place both pans in oven; bake about 60 to 80 minutes until top is golden brown. NOTE: Center should be slightly firm; carefully remove both pans from oven. Carefully lift the spring form pan to a rack; remove the foil from pan. When completely cooled cover and refrigerate overnight. Run a knife around inside edge of pan to loosen cheesecake; remove sides. TO SERVE cut into slices; spoon a little blueberry sauce over each slice. Arrange extra blueberries around plate.